As a Microsoft Partner we are very familiar with the setup of Office 365 email services on BlackBerry 10 devices. BlackBerry 10 is an excellent, flexible and secure mobile operating system. If you domains DNS is properly configured and you follow these directions you will be up and running in less than 5 minutes. You will be asked to confirm which info you would like to sync, we recommend syncing all of the available choices. See the image on the right. Press Done. 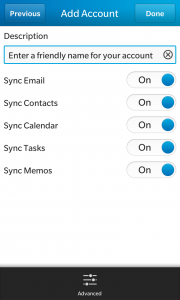 Depending on the volume of mail in your Inbox and the number of contacts you have, it will take some time to sync all info to your BlackBerry. Directions on how to setup Apple’s iOS 9 devices with Armada Data ActiveSync email service.